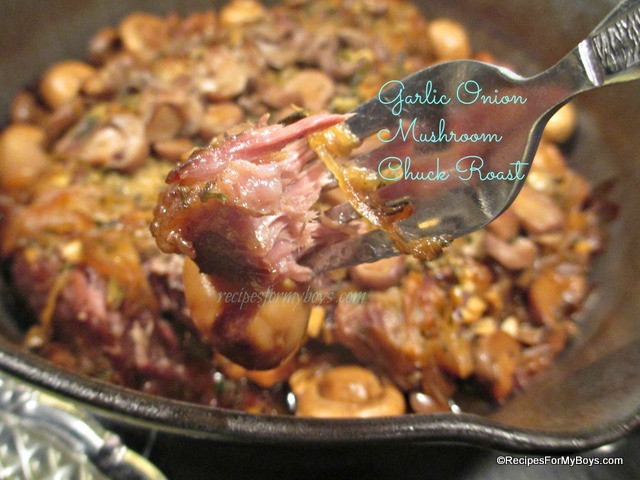 Great combinations of flavors and one of my favorite ways to cook a roast. I use fresh vegetables whenever possible. However, I was out of celery and mushrooms, and didn't get to go to the store, dried celery and canned mushrooms worked well. Please take a moment to check out the ads on my blog. By doing so, you are helping support it. Thank you! Preheat oven to 350 degrees F. Spray a dutch oven or roasting pan with a lid. Rinse roast, pat dry and place in dutch oven or pan. Pour half can of consomme' over roast, or however much is needed to reach halfway up the roast. Top with celery leaves, garlic and onion slices. Sprinkle salt and pepper over onions. Cover dutch oven and cook for two hours checking at one hour to see if additional consomme' is needed. Add drained mushrooms, cook another hour or until fork tender. Season with additional salt and pepper, desired. Note: When using fresh celery, cut into 1" or larger, pieces. You can also cut the onion in larger pieces as well. The mushrooms can be left whole or halved. Adding all at the beginning of cooking time.